Some pretty big things have happened to both Nika and I recently - Fotango is no more (so yes, that means I'm available for hire ;-), and Multimap got bought by Microsoft. 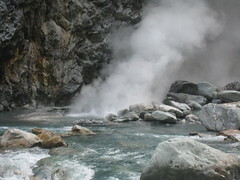 Since I met CLK he's always banged on about how great Taiwan's hot springs are, so we thought we'd put it to the test ;-). It'll be nice to get out of London's constant bustle and into the mountains, do some hiking, and make a fool of myself trying to speak mandarin again. Then there's a brief moonlight in Hawaii where I can try out my Magnum PI impression... If I start now, I might not have to buy the mustache! Then we hit Canada again to visit family & friends, admire my parents new wooden floors, go x-country skiing, and heck, maybe even dog-sledding now my sister's got an Alaskan Malamute. We got the LED lighting installed a couple of weeks ago, and they've been happily glowing away since then! As you can see in the pictures, we've got 4 Golden Dragon LEDs running off a variable-voltage (ie: dimmable) power supply I knocked up. 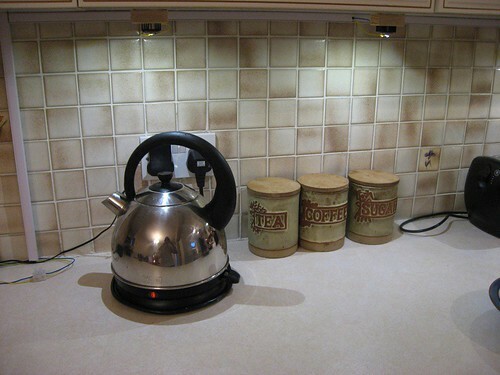 You can see the difference between the colour-temp of light produced if you look at the reflection in the kettle. We still haven't covered them, but now they're installed I'm not so sure the light needs diffusing, so I've taken a raincheck on that one. The light looks good: Its bright, slightly less yellow than regular light bulbs, but not clinical white and most importantly, doesn't hurt my eyes. We had to be careful to make no permanent modifications as we're still renting. Otherwise, it would make sense to embed the lights into the cabinets, cover them with fancy-looking filters, and run the wires through the walls to a dimmer switch (also attached to the wall). I'll try to keep these URLs active when I eventually do move. I've been having a hell of a time over the past few weeks trying to figure out how to build a low-voltage, low-power lighting system. I considered the pros & cons of each, ie: LEDs consume the least power, but don't typically look that good. Halogens consume less power than regular lights, but still eat a lot more than LEDs. Each christmas light consumes about as much as an LED but provides nowhere near the amount of light. etc. etc. I was really tempted by LEDs simply because they draw the least power. Unfortunately all the LED lights I've seen in stores look absolutely horrible! They're called cold white but operating table white would be a better way to describe 'em. Even what store attendants call warm white looked terrible. Gives me a headache just thinking about it. And then there's the price... around £40 for a single-LED light in a basic fixture! And the 'drivers' (which I don't need anyway). It all served to put me off. I'd almost given up on them when I came across a comment by Joe Russack when googling around. On reading through his experiments with LEDs I decided to try something similar. 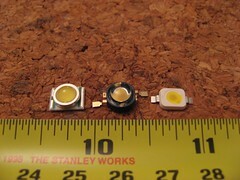 I found Cree XLamp 7090 XR, Luxeon I and Golden Dragon LEDs at RS Components, an online electronics store I use. At ~£3.50 each, that's a lot cheaper than the lighting stores! Still, I realized I'd have to do extra work (like building heatsinks, and a 'driver') for them which can be expensive, but I would've had to most of that anyway regardless of the solution I chose. So I decided to dive in & buy one of each (I opted for warm white based on what I've read about colour temperature). When they arrived I almost blinded myself & Nika trying them out with a few AA batteries... they're definitely bright! I was also encouraged by the quality of the light - it seems to be a lot less cold than the LEDs I've found in lighting stores. Off to a good start! I soon realized that the Cree XLamp 7090 XR was gonna be difficult to work with because it has no easily solderable terminals (I didn't want to muck about with reflow soldering at this early stage). But the Luxeon I & Golden Dragon were easy enough to work with. I grabbed the Luxeon I, copied some ideas off Joe and a dozen other people (in particular, VK2TIP's Regulated Power Supply - High Current Page and National Semiconductor's LM1086 spec's application suggestions) and hacked up a prototype. I ended up with something like this. Unfortunately I ended up frying the Luxeon I in a blaze of stupidity. But that gave me the opportunity to gain first-hand experience of how well the heatsink epoxy works. *sigh*. When I finally managed to chip it off I was able to replace it with the Golden Dragon. 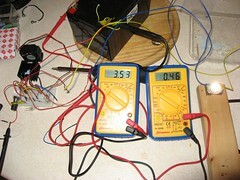 The circuit draws 0.46A at 3.53V, or 1.6W - not too shabby! I've not yet calculated how much the cooling fan and voltage regulator are drawing, but I suspect altogether it'll be nowhere near 10W. To my understanding, if I have several lights in series the regulator should dissipate less power, which is just what I need. I've ordered some more LEDs (including a Luxeon Star which should be much easier to glue to a heatsink) and will try & string everything together sometime soon. I'm thinking 4 or 5 lights in total. Once that's done I'll have to figure out how to dissipate the light. All in all, this is looking quite promising! The 12V DC - 230V AC power inverter consumes ~0.7A @ 12V = 8.4W! When the inverter is close to running out of power it complains with a rather loud beep! Altogether, this makes our initial setup rather impractical. That's why I decided a few weeks ago to try and solve these problems by increasing capacity, decreasing consumption, and introducing a monitoring system. My goal is to produce a practical & convenient system that we'll use on a day-to-day basis. Adding a monitoring system was the first step, and the easiest one. After an extensive research effort I decided the Steca PR1010 was the best fit for what I was trying to do. The best price I could find for it was on the Alternative Energy Store for £62. They were extremely helpful there, and delivered the item within 2 days - consider me a happy customer! Installing it was also a breeze, and instantly gave me the information I was looking for. Next, I focused on increasing capacity. So far that's also been relatively easy, though again I spent a lot of time researching the options. While wind power is interesting, I decided to shelve the idea for now - it's either a lot more expensive to buy turbines, or a lot more effort to make them. Not that solar panels are cheap, mind you - this has probably been the most expensive part of my experiment. After shopping around, I opted for 2x 40W panels from a well-known brand, Kyocera (the KC40T modules). The best prices I found were from a company called Bright Green Energy, and the person I dealt with (named Alex) was extremely helpful... he went out of his way to ensure the panels were delivered within 2 days - again, a happy customer. I've not yet bought a bigger battery, but I've got my eye on a Numax XV31MF sealed lead acid battery from Soapy Smith's. 113Ah would give us almost 5x the capacity we have at the moment! 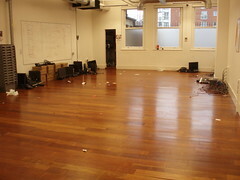 Unfortunately, since we've moved homes recently I've had to dismantle the whole system. Getting a new battery can wait until I've had a chance to settle in! Still, with the 2 new panels hooked up, I was able to fully charge the batteries within 2-3 sunny days (with the position of the panels we only got 3-4hrs sunlight). With all 95W of panels I've seen 5-6 Amps going into the batteries which is a lot better than the 1A max I saw with only the 3x 5W panels. So I'm on the right track. Decreasing consumption has proven to be the most challenging step, and I'm still experimenting with things. The key challenge is that most consumer devices are shipped to work at mains voltage (230V @ 50Hz AC in the UK). While cars, caravans & boats tend to operate on 12V or 24V DC, they're backed by an engine-powered alternator which means product designers don't have to be as worried about energy consumption. I've decided to tackle lighting first as they've proven to be the biggest consumers I have. A few weeks ago, I met up with some old work colleagues and got into talking about some of the changes I was trying to put into place a few years ago when I first joined. A lot of them were quite basic things like writing unit tests, running nightly smokes, object-oriented programming, modular development, some basic design patterns, refactoring, deprecating legacy code, and using off-the-shelf software instead of re-inventing the wheel in-house. It was nice to hear that that most of the ideas & suggestions I'd made then (years ago) were finally coming into play. One of my fellow developers even said I was years ahead of my time, which was quite flattering! I can tell you though, it was not an easy ride! In the months after I'd joined, I worked a lot of overtime to put together training slides, and create a development framework the rest of the company could use. I wrote documents containing analyses of what I saw as key issues, included several options for resolving them and made recommendations. I then circulated these documents around, and spent hours trying to convince people of the issues I saw, and ways we could fix or avoid them. During this time I felt a lot of resistance from key people - it seemed many of my suggestions hit a brick wall, and it took me a while to fully understand why: after about 6 months at the company I realized I'd made some key mistakes which only served to undermine the changes I was pushing for. That in conjunction with some political resistance to the changes, sprinkled with (what I saw as) poor management stopped a lot of things short. In the following months, I went out of my way to change my behaviour, but even that seemed to have little impact - the damage was already done. It was a rather de-moralizing time. I didn't establish enough of a sense of urgency. While I did convince some key people (which is why I believe many of the efforts have succeeded now), I didn't convince enough people how big a deal the issues I saw were. I didn't create a 'powerful guiding coalition'. I created a vision, but didn't communicate it anywhere near enough. I went ahead and started the change effort, effectively on my own. Talk about stupid. I even remember a conversation with one of my peers who pointed out developers like to be convinced, not told what to do - while we disagreed on a number of points, I've gotta say he was right on the money there. While I did my best to communicate the issues I saw and the vision I had, it simply didn't reach enough people. Of course, I could argue that I didn't get the support I needed to make this possible, and you might counter that I would have had the support had I convinced the right people. Then I could say if I'd had some time (that wasn't my spare time) to spend convincing people I would have. And it might go on like that for a bit. But that's all moot point, really. a good leader will find a way to get important points across, and will work with their team to solve issues instead of dictating solutions. a good leader must be willing to change themselves in the process of changing others. Oh yeah, and: I was hired into completely the wrong position for what I was trying to do. I'm glad that all that effort finally paid off, and that I was able to change people & a company in a positive way, even if it was hard to get there! I'm also glad I had the opportunity to learn something about leading change efforts, and what not to do ;-). Well, OSCon is all wrapped up and I'm on a plane to Ottawa. Unfortunately for us (and fortunately for him? ;-) this was Nat Torkington's last time organizing an O'Reilly conference - he's done a great job! It was great to meet so many interesting & intelligent people... it's both daunting and inspiring at the same time! I always find it interesting to go to conferences and see all the new innovations. In IT, it's not really that surprising to see the boundaries continually being pushed - as Simon Wardley describes commoditization: "yesterday's hot stuff becomes today's boredom". Take operating systems and databases: only a few decades ago they were university's research projects, or government / big-company trade secrets, but today everybody needs them and they provide little real competitive advantage for the majority of organizations. While I don't believe Oracle, Sybase & Windows are going away any time soon, I think this - commoditization - is largely the driving force behind the success of Open Source projects like Postgres, MySQL & Linux. The fact that profitable businesses have be built around them is a testament to my belief that the true value of Open Source has always been in sharing the common costs of doing business over many organizations. Extending this idea to hardware seems a natural progression. During the Radar sessions, I spoke to Christy Canida who's responsible for Community & Marketing at Instructables. She quickly impressed me with the idea - the site hosts step-by-step instructions for, well, pretty much anything! From DIY taxidermy to hardware howto's to cooking recipes to guides to building your own sailboat. They're building up a network of people interested in contributing and have come a long way... Go have a look! After seeing the Radar session, I decided to go to Bunie's talk on Chumby, a device that is always connected to the internet & displays 'useful' info. I was impressed to hear he'd been working on an Open Source Hardware License for Chumby, and found it interesting to learn about the various barriers to entry for hacking on the device even with the plans. I almost burst out laughing during his talk when I found "SETEC ASTRONOMY" printed on the middle of the Chumby circuit board he'd handed around;-). What impressed me most was Bunie's business strategy behind 'Open Sourcing' the hardware product - if anyone can produce his product cheaper, he's not worried about competition because it effectively lowers his cost of production - he can either source his products from the new provider, or presumably re-use their designs (given the terms of the Chumby license) to lower his own costs. I also really enjoyed some of the keynotes, particularly James', Simon's, and Nat's. 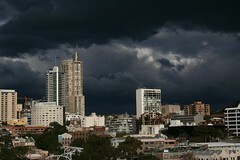 Well, my luggage arrived last evening, all in one soggy piece. It smelled, well... great, as you can imagine! I'm still a bit puzzled how my belt ended up smelling like fish. I arrived in Portland yesterday for OSCon next week - I had originally arranged to travel early to help set up our booth, but as that's not happening now I've got the weekend to spend getting to know the place. Unfortunately my luggage got caught in a "baggage jam" at Heathrow, and they didn't have time to get it onto the plane (considering our departure was delayed for over an hour I found that surprising, but hey, it could've been a lot worse). Fortunately I had some essentials in my carry-on, and they should be delivering the rest real soon now. Jet-lag is looming... even though I managed to stay up until 10 or 11 yesterday, my body's telling me to go to sleep right now. Think I'll drag myself over to the Lloyd Center and see if I can't join the Harry Potter madness to keep myself awake for just a few more hours.